Mercury scientists' very long wait for new data from a spacecraft at Mercury will finally come to an end on Monday, when MESSENGER makes its first close approach to the innermost planet. The last (and first) visitor to Mercury was Mariner 10, which flew past the planet three times in 1974 and 1975. Since Mariner 10's 3,500 images of the planet covered only 45 percent of its surface, Mercury has the largest surface of any solar system body -- including Pluto -- never yet observed up close. MESSENGER's first flyby will change that, generating 700 gigabytes of data, including 1,300 images, over 55 hours surrounding the closest approach on January 14, 2008 at 19:04:42 UTC (11:04:42 PST). 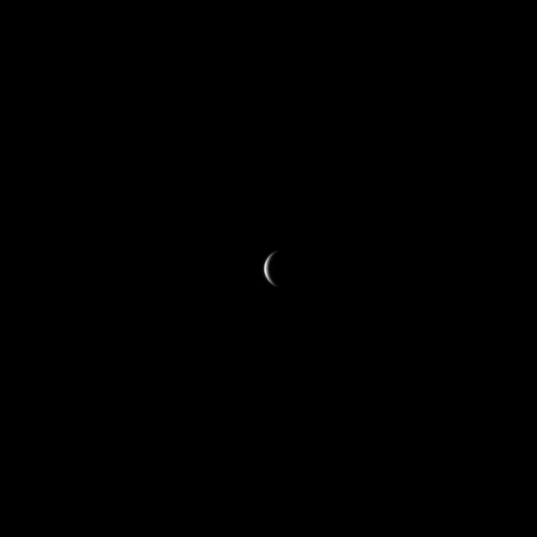 MESSENGER snapped this image of a crescent Mercury on January 9, 2008 when it was about 2.7 million kilometers from the planet. MESSENGER is near the midpoint of its seven-year journey to Mercury orbit. As MESSENGER Mission Systems Engineer Eric Finnegan explained during a press conference held this morning, it has already completed three planetary gravity assists and two deep-space maneuvers and "is now poised to start the last leg of its odyssey of the inner solar system." This last leg will include three flybys of Mercury before orbit insertion in 2011. Each flyby will slow the spacecraft, dropping it into a lower orbit with a shorter period, Finnegan said. "After being lapped by Mercury many times in their race around the Sun, MESSENGER will ultimately match the 88-day orbital period of the innermost planet." The primary goal of the first Mercury encounter is to slow the spacecraft by 5,000 miles per hour and decrease its orbital period by 11 days. MESSENGER's trip to Mercury requires a total of six gravity assists (one of Earth, two of Venus, and three of Mercury) to permit it to enter orbit at the small planet close to the Sun. This animation shows that journey and the motions of Venus and Mercury using a frame of reference that holds the Earth-Sun line fixed. Although the gravity assist is the primary goal, MESSENGER's science team plans to take advantage of the first Mercury flyby in 33 years to perform a crammed schedule of observations. In fact, mindful of the hazards faced by any space mission, the science team aims to accomplish as many mission science goals as possible even before they get into orbit. The most visible result of the flyby will be the first images of the side of Mercury unexplored by Mariner 10, including the left half of a huge multi-ringed impact basin named Caloris. Because of its trajectory, Mariner 10's three flybys happened exactly one Mercury solar day apart, which means that the same range of longitudes on Mercury was sunlit all three times (from 350 through 0 to 170 degrees East longitude). For MESSENGER's first Mercury flyby, a different longitude range will be illuminated, from 96 to 276 degrees East. So slightly more than 100 degrees of longitude, or 30 percent of Mercury's surface, will be imaged for the first time up close. "Probably the first thing that most of us want to see [from MESSENGER] is what the other 55% of Mercury's surface looks like," says MESSENGER Participating Scientist Faith Vilas. "If you've followed any of solar system exploration, you know that you can't get cocky about this; every solar system body looks different from every other solar system body." Vilas was referring obliquely to the idea that Mercury is a ho-hum copy of the Moon. 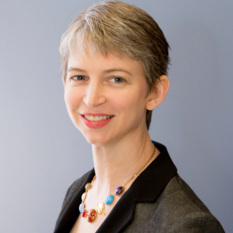 She pointed to the early history of Mars exploration, when each spacecraft produced discoveries of new landforms leading to entirely different interpretations of that planet's geologic history, and predicted that the unseen hemisphere of Mercury should hold "big surprises." Mariner 10 flew by Mercury three times in 1974 and 1975, seeing the same hemisphere sunlit each time. 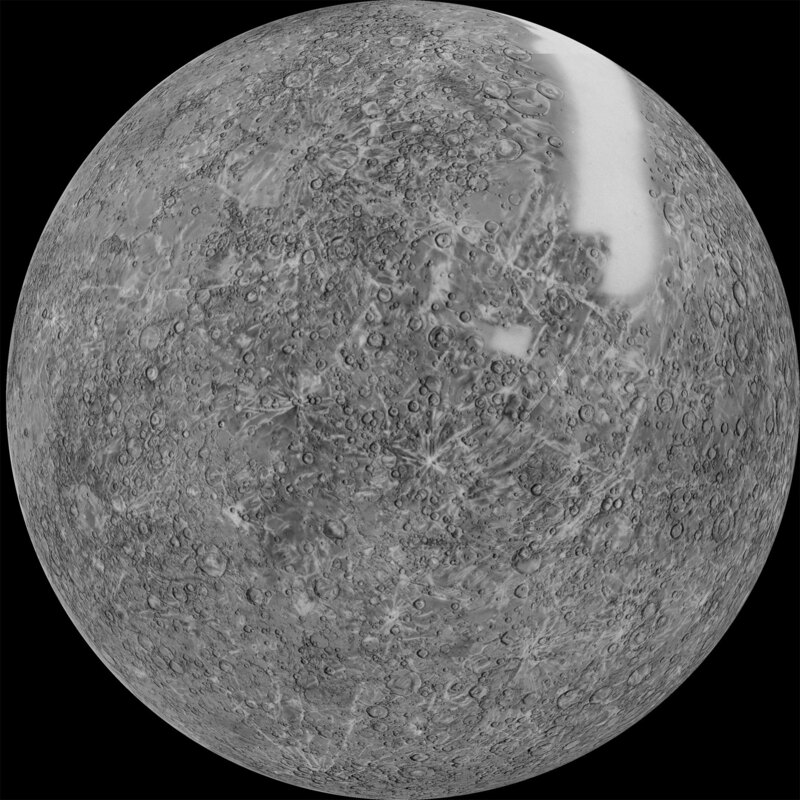 As a result, fully half of Mercury's surface is still terra incognita. Some of the blank area on this map has been imaged from Earth at lower resolution using radio telescopes. Apart from the imaging, there will be many other firsts, explained MESSENGER principal investigator Sean Solomon. "We're going to make the first measurements ever made of the elemental composition of Mercury's surface. We're going to make the first spacecraft measurements of its surface reflectance in visible, ultraviolet, and near-infrared light, to give us important clues to the mineral makeup of Mercury's surface materials. MESSENGER's flight through Mercury's "tail"
This animation shows an artist's conception of Mercury's magnetosphere at the time of the MESSENGER flyby. The graphs at the bottom show observations made by the Fast Imaging Plasma Spectrometer (FIPS) instrument as the spacecraft flew past the night side of Mercury. The top plot depicts low-energy plasma -- which comes from the solar wind -- and the bottom plot shows heavy ion intensities associated with the planet. "Mercury is the only inner planet [other than Earth] to have a global-scale magnetic field -- we don't know why -- and what could provide the answer is better measurements of the geometry of that field. Mercury's tenuous atmosphere is very dynamic; we don't understand it. Some of the atmospheric material, including sodium, is in a huge tail that extends many planetary radii from the planet. We're gong to fly through that tail and make measurements of it." In fact, the three Mercury flybys provide a unique opportunity to observe this tail region of Mercury's atmosphere and magnetic field; these regions will not be accessible to MESSENGER once it enters orbit. Solomon continued, "We're going to make the first laser altimetric measurements of the shape and topography of Mercury. That is going to improve our understanding of the gravity field first sensed by Mariner 10. That information will, in turn, tell us about the internal structure of Mercury, in particular the nature of its huge core." Understanding why Mercury's core is so large -- the planet is approximately two-thirds iron metal -- could illuminate some of the dynamic and chaotic workings of the inner solar system, Solomon explained. "The discovery of extrasolar planets made planetary scientists aware of the fact that even giant planets like Jupiter are capable of migrating. Interactions could have kicked objects to substantially different places in the solar system than they started out. And so something as small as Mercury need not have formed in place. It may have, but we have to go into this with an open mind, recognizing that we don't know what we're going to find." This animation contains 17 frames from a high-definition movie of MESSENGER's first flyby of Mercury. Blue squares show the fields of view of wide- and narrow-angle cameras at different times during the encounter (the wide-angle camera has a field of view 7 times larger than the narrow-angle camera). The full animation is available from the MESSENGER website in low and high resolutions (10.4 MB and 84.2 MB), covering the time from 2 hours and 40 minutes before closest approach to 1 hour and 45 minutes after closest approach, with time sped up by a factor of about 90. As MESSENGER will streak past Mercury at a relative speed of 7.2 kilometers per second (16,000 miles per hour), it has a relatively short period of to accomplish all these science goals. The timeline begins Sunday morning, when MESSENGER will turn its main communications dish away from Earth to point its instruments at Mercury, its magnetic field, and atmosphere. For the next 55 hours, there will be no telemetry or data received from the spacecraft, but tracking stations should still be able to pick up the spacecraft's radio beacon except for a period of 48 minutes around closest approach, when the bulk of Mercury will block Earth's view of the spacecraft. In the middle of this occultation period, MESSENGER will also pass behind Mercury as seen from the Sun, entering a 14-minute period without solar power. And while it is both occulted from view at Earth and eclipsed from the Sun by Mercury, MESSENGER will pass its closest approach to the planet, merely 200 kilometers (124 miles) from the surface. Although loss of radio contact with a spacecraft always leads to some anxiety, Solomon pointed out that the first Mercury flyby is MESSENGER's fourth planetary flyby (following one of Earth, on August 2, 2005, and two of Venus, on October 24, 2006 and June 6, 2007), and he had no particular concern about being able to recover the signal from the spacecraft once the occultation period ends. Data won't begin streaming down from the spacecraft until 22 hours after closest approach, midday on Tuesday Eastern time; and the first views of Mercury to be returned will be ones taken during the approach phase, when MESSENGER's view is of a thin crescent, with the only sunlit terrain being that already imaged by Mariner 10. The first images of the previously unseen regions will likely not be returned until Wednesday, and the rest of the data may take a week to arrive on Earth. Therefore, Finnegan said, it may take "one or two weeks" for the first images to be released to the public. Data to be taken during the flyby will eventually yield two movies, a color one of Mercury's growing crescent from the approach phase, and a monochrome one of its retreating globe from the departure phase. In addition, many high-resolution mosaics covering the surface of the planet are planned, including one that should stretch 9,000 pixels from north to south. Following is a moment-by-moment timeline of MESSENGER's science observation plans for the flyby. With the wide-angle camera, MESSENGER will shoot 86 frames for a movie showing Mercury's crescent growing in the spacecraft's forward view. The movie is being shot purely for public outreach purposes, through the three camera filters necessary to produce it in color; all of the rest of the color imaging during the flyby will employ all 11 of the wide-angle camera's color filters. MESSENGER's magnetometer (MAG) can take measurements of magnetic fields at a variety of rates, from once every 100 seconds to 20 times a second. For the 12 hours surrounding closest approach, it will be operated at its highest rate. As MESSENGER approaches Mercury, the X-ray spectrometer starts taking measurements more rapidly. However, the X-ray spectrometer operates best within about 100 kilometers of Mercury, a distance it won't enjoy until MESSENGER actually goes in to orbit in 2011. Still, data from the 15 minutes surrounding closest approach will be a valuable first look at Mercury with this instrument. Mercury has an extended sodium tail that resembles the tails seen by comets when they are close to the Sun. As it approaches, MESSENGER will roll up and down to carry the MASCS line of sight across the tail, from north to south, in order to map its vertical extent. Similar to the X-ray spectrometer, the gamma-ray spectrometer (GRS) increases the frequency of its observations for the short time around its closest approach to Mercury. The laser altimeter warms up in preparation for one precious altimetric profile across Mercury, to be taken around closest approach. MESSENGER will pass behind Mercury as seen from Earth; no communications will be received from the spacecraft until it emerges from behind Mercury more than an hour later. Now, close to the planet, MESSENGER will rotate so that the laser altimeter can fire downward and measure Mercury's topography. The MASCS team expects to observe differences in ultraviolet emission from Mercury's dayside and nightside; the dayside emission should be much brighter. For 13 minutes, MESSENGER will be hidden from the Sun. MESSENGER will pass within 200 kilometers of the surface, firing its laser all the time. With a view of a largely sunlit Mercury, MASCS shifts from observations of the exosphere to measure the composition of the planet's surface. MESSENGER has now moved farther from Mercury than its eventual elliptical orbit will take it, and MASCS can no longer observe the surface. It will return to observing the exosphere, which should be much brighter than the nightside exosphere. Although MESSENGER has reappeared from behind Mercury, MESSENGER's radio signals will take almost ten minutes to travel the 170 million kilometers separating it from Earth, so MESSENGER mission control must wait to hear from their spacecraft. At the start of this movie, Mercury will fill the narrow-angle camera field of view. A total of 288 frames will be shot over the next 18.5 hours at a rate of one frame every five minutes. In the final image taken during the encounter, Mercury will still be more than 200 pixels across. This mosaic of Mercury was assembled by Ted Stryk from many individual frames taken by Mariner 10 as it departed Mercury after its first flyby on March 29, 1974. The Caloris basin is just visible on the terminator (day-night boundary) on the left side of the image. MESSENGER's science team will hardly have a chance to digest the data from the first flyby before the spacecraft approaches for its second Mercury flyby, on October 6, 2008. That encounter will also have its closest approach on Mercury's night side (a geometry dictated by the physics of the gravity assist), but it will take place almost exactly 1.5 solar days later, meaning that almost exactly the opposite hemisphere of Mercury will be illuminated. Thus, by the end of 2008, we should have in hand a nearly complete map of Mercury from MESSENGER. 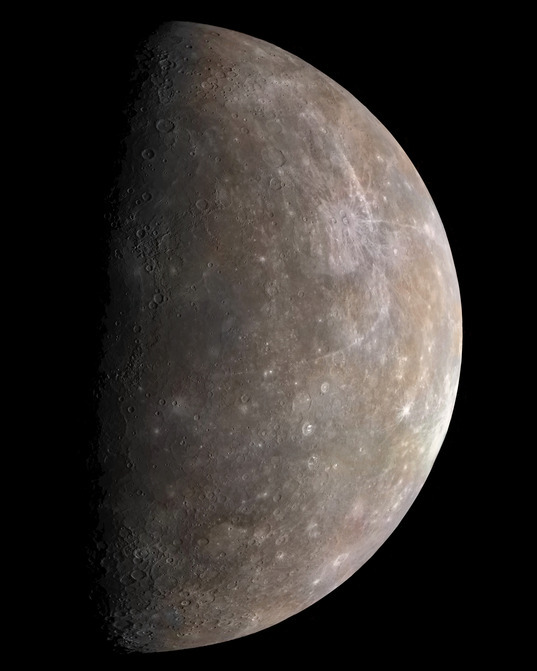 Stay tuned to The Planetary Society Weblog for the latest images and news from MESSENGER!